Each initiate, upon entering the Order, receives a symbolic apron, which is to be worn during all Masonic meetings and rituals. 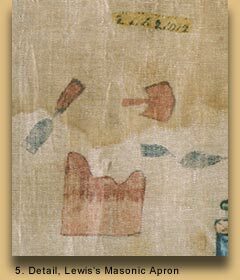 This apron of Lewis's, made of hand-painted silk backed with linen, measuring 14½ by 16½ inches, is said to have been in a pocket of his coat when he died. 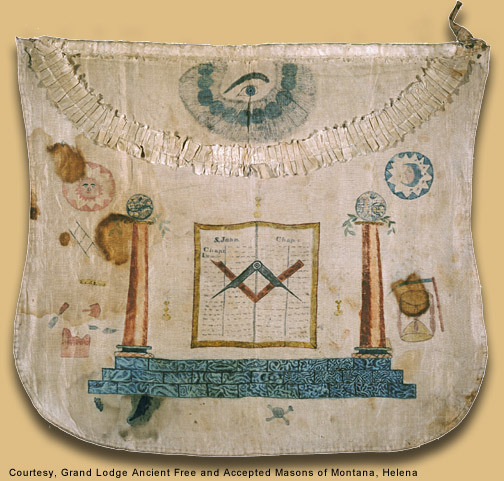 It was passed down from his mother to his sister, Jane, and through her descendants to the Grand Lodge of Missouri, whence it was purchased in 1960 by Joseph Hopper, who donated it to the Montana Masonic Foundation of the Grand Lodge, Ancient Free and Accepted Masons of Montana, in Helena. The meanings of some of the symbols on the apron are open to varying interpretations in different Masonic jurisdictions (states or countries) at different times. The following are those currently held by the Grand Lodge AF&AM of Montana, provided through the courtesy of Reid Gardiner, Grand Secretary. The two pillars of the porch of Solomon's temple represent strength and stability.2 The pillar at left stands for Boaz, interpreted by some Biblical scholars as meaning "in strength"; that on the right symbolizes Jachin, or "God will establish" (1 Kn. 7.21; 2 Chr. 3.17). They represent, respectively, the Senior and Junior Wardens of the Lodge. The pillars rest on three stone steps that symbolize the three ages of man--youth, manhood, and old age--and the three corresponding degrees of the Order. The lowest represents the Entered Apprentice, who is obliged to occupy his mind industriously in the attainment of useful knowledge. The second step stands for the Fellow Craft Mason, who is charged to use his knowledge in the discharge of duty to God, to his own neighbor, and to himself. The topmost step is that of old age, when the Master Mason may "enjoy the happy reflections consequent on a well-spent life, and die in the hope of glorious immortality." The skull-and-crossbones is an ancient symbol for death. The comparative crudness of this example, and the fact that it does not belong in the overall symmetry of the design, suggests that it might have been added after the owner's demise. At lower center is a perfect or smooth ashlar, "a stone made ready by the workmen to be adjusted by the working tools of the fellowcraft," representing the state of perfection to be reached by "a virtuous education, our own endeavors, and by the blessing of God. "3 Next clockwise is an operative mason's chisel, which represents the tools the speculative mason uses to shape himself into a better individual. Next is a maul used by operative masons to tap stones into place; as a symbol it suggests the process of integrating a speculative mason into the Lodge. Beneath the maul is the working mason's trowel, symbolically used by the speculative mason to spread the cement of brotherly love and affection. The ruler above the maul represents the 24-hour day "divided into three equal parts devoted to God, usual vocations, and rest." 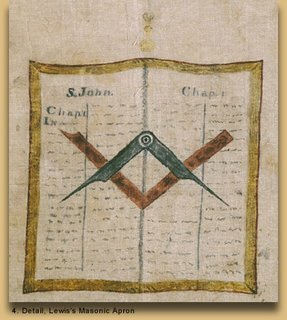 At the center of the apron the Bible is open to Chapter 1, Verse 1--"In the beginning was the Word"--of the Gospel according to St. John, the patron saint of Freemasonry. Superimposed is the square that an operative mason would use for testing angles; to the speculative Mason it stands for justice. Atop the square is a compass or divider, which the former employed for measuring equal lines, the latter for restraining prejudice. Faintly seen on each side and above the Bible are single candles in brass candlesticks, which represent the three stages of the sun and the seats of the three main officers and guides of a Lodge. At one side is the rising sun represented by the Worshipful Master, whose seat is on the east side of the Lodge; above is the mid-day sun in the south, where the Junior Warden is seated; on the west side is the setting sun, represented by the Senior Warden's chair. The Scribe of the Door to Virtue Lodge No. 44 of the Ancient Free and Accepted Masons in Albemarle County, Virginia, recorded on December 31, 1796, that Lieutenant Meriwether Lewis, on furlough from his Western Pennsylvania post in the U.S. Infantry, "was recommended as a proper person to become a member." Less than one month later, on January 28, 1797, he was elected to membership, initiated as an Entered Apprentice, and given his apron. On the following evening he was admitted to the second, or Fellowcraft degree, and without further examination, promoted "at sight"--that is, by unanimous ballot--as a Master Mason. Such meteoric progress through the first three degrees of Masonry signified confidence on the part of the most prominent men of Albemarle that the 23-year-old Lewis was similarly destined for moral, civic, and political leadership.A little more than two months later, on the second or third of April, members of the Door to Virtue Lodge conferred upon Lewis the degree of Past Master Mason. At the same meeting two other leading Virginians were elevated to the same status. They were Peter and Samuel Carr, nephews of Thomas Jefferson, whose son-in-law, Governor Randolph, was also in attendance. On October 31, 1799, Lewis was "Exalted to the sublime degree of a Royal Arch, Superexcellent Mason" at Widow's Son Lodge4 in Milton, Virginia, a few miles southeast of Charlottesville. On that occasion he was given a Royal Arch apron, which is now at the Missouri Historical Society.In 1801 Lewis, who had been promoted to the rank of captain in late 1799, became the private secretary to President Jefferson, and in July of that year received his official orders as commander of the expedition to explore the Northwest. Lewis no doubt carried his apron during his preparatory travels, as any wayfaring Mason would have. There is reason to believe, for instance, that he attended a Lodge in Pittsburgh while awaiting the completion of the keelboat from July 15 until August 31, 1803. If he carried a Masonic apron on his expedition to the Pacific, which might have been expected of a Mason of his rank undertaking such a hazardous mission, he did so in total secrecy.Two years after the Corps of Discovery's return, Lewis, then Governor of Louisiana Territory, was instrumental in establishing the first Lodge in that city, and on September 16, 1808, by authority of the Pennsylvania Grand Lodge, he was installed as Master of the Saint Louis Lodge No. 111. In September of the following year he left St. Louis on what was to be the final journey of his life, first relinquishing his Master's chair to Frederick Bates, the Secretary of the Territory and acting governor during Lewis's absences. Ironically, more than eight years earlier Bates had applied for the position of private secretary to the President, but Lewis was chosen instead.5It was at Lewis's encouragement, no doubt, that William Clark joined the new Lodge in St. Louis. In fact, Lewis may have begun prosyletizing his co-captain during the early months of the expedition. Late in January, 1804, Clark copied into his journal a definition of the five senses, from Owen's Dictionary, which was in the company's small reference library. The subject was entirely out of context with the expedition's business at that moment, but the paragraph reads like a précis of a catechism for an Entered Apprentice. Clark's certificate confirming that status, dated September 18, 1809, is at the Missouri Historical Society; his apron is at the Lodge in St. Charles, Missouri. His funeral service, on September 1, 1838, opened with the full Masonic burial rite.